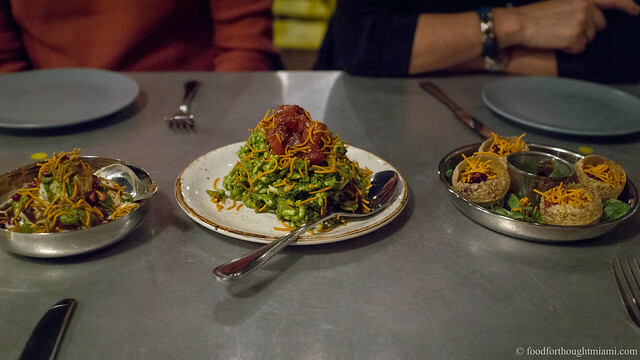 Fergus Henderson may have helped convince the world that British food was worthy of attention with his restaurant, St. John (some more thoughts on St. John here). But at Rules, they were never in any doubt. 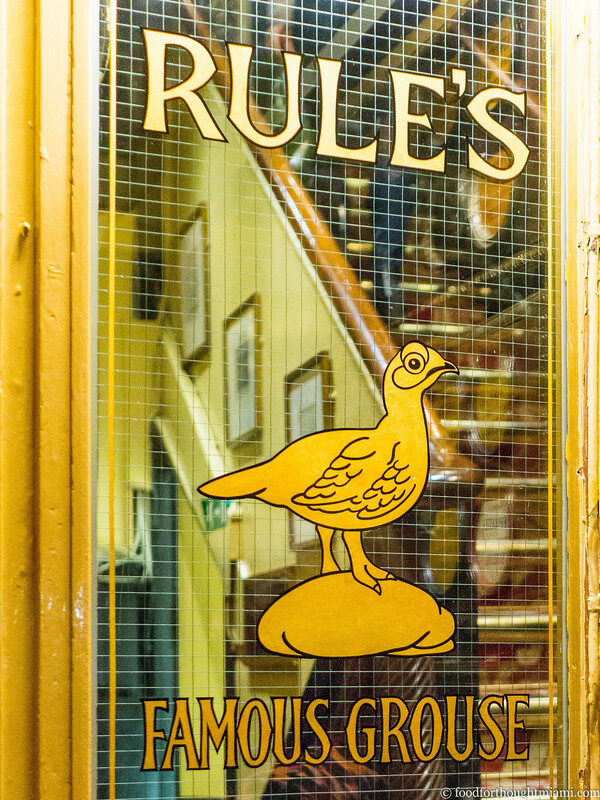 Rules bills itself as the oldest restaurant in London. Over the past two centuries, it's been owned by only three families: Thomas Rule opened it in 1798; just before World War I, one of his descendants decided to move to France, and arranged a swap with a Brit running a restaurant in Paris named Tom Bell; and then in 1984, Bell's daughter sold the restaurant to its current owner John Mayhew. 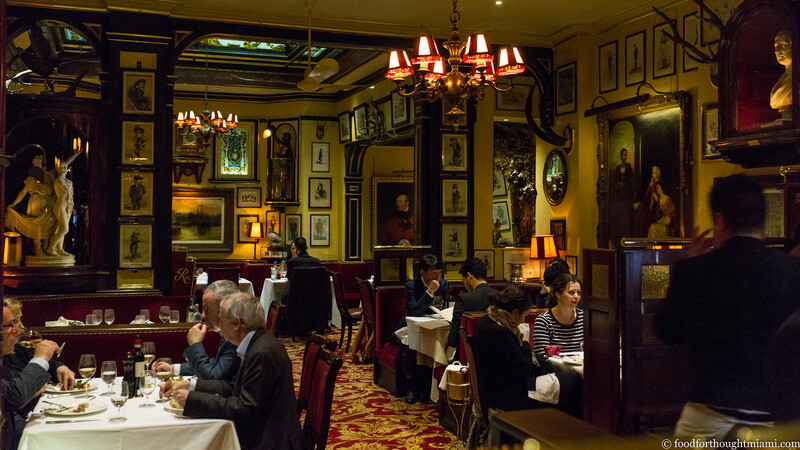 The dining room, with its red velvet-wrapped, gold-piped banquettes, polished wood dividers, oil portraits and old cartoons on the walls, the occasional marble bust here and there, looks every bit the part. If not for the bona fides of its history, the stereotypically posh decorations would seem almost laughable. I adore the place. We first came here on a family trip to London more than ten years ago. Our daughter was about six years old at the time; she did not adjust well to the jet lag, and within an hour she was sliding under the table. This time around, I was the one who wanted to throw a fit when I learned that we had just missed game season. Through the present owner's inheritance of the Lartington Estate in northern England and relationships with local game dealers, Rules sometimes has a glorious assortment of wild things on the menu – its "famous grouse," but also woodcock, pheasant, partridge, wild duck, hare and more. Alas, not on this visit. (You can see all my pictures in this Rules - London flickr set). 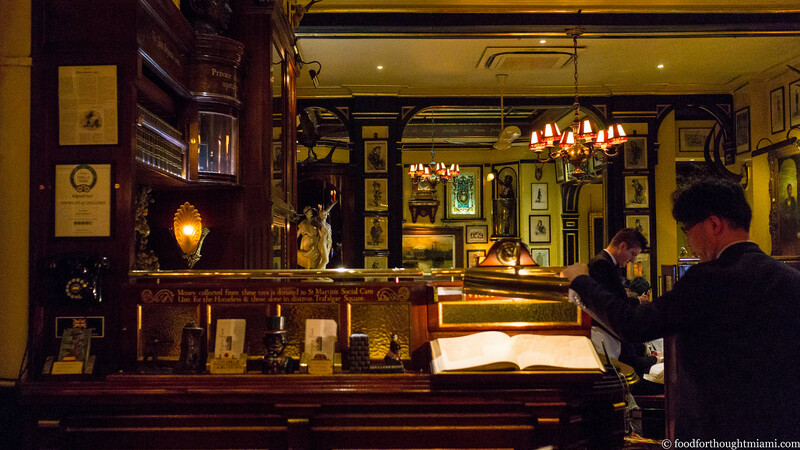 Before getting to the food, I highly recommend a visit upstairs to the Edward VII Room, a/k/a the cocktail bar, a snug spot with a carved wooden bar counter, a few tables and couches, and a fine assortment of hunting murals and trophies adorning the walls. The bar program is run by Mike Cook, and his crew can handily make the classics like a pitch-perfect Negroni. But they also have their own creations, like the intensely aromatic Lucia Sciarra, named after a character from the last James Bond film, Spectre. Once I'd recovered from having missed game season (my recovery aided by a pleasant cocktail), I focused my attention on the menu, which also helped ease my disappointment. You get the sense it could have been written a hundred years ago. Chef David Stafford shows occasional flashes of whimsy, like a duck leg "pastilla" paired with a spiced duck breast, but for the most part he proudly and lovingly cooks traditional British dishes. And this he does exceedingly well. 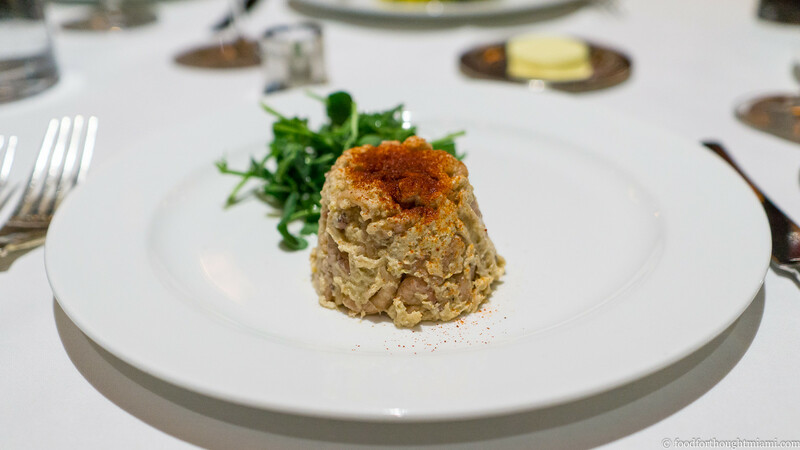 So there's potted shrimps, a mound of tiny, tender brown crustaceans caught in Morecambe Bay, preserved in butter and spices in the way it's been done for hundreds of years. 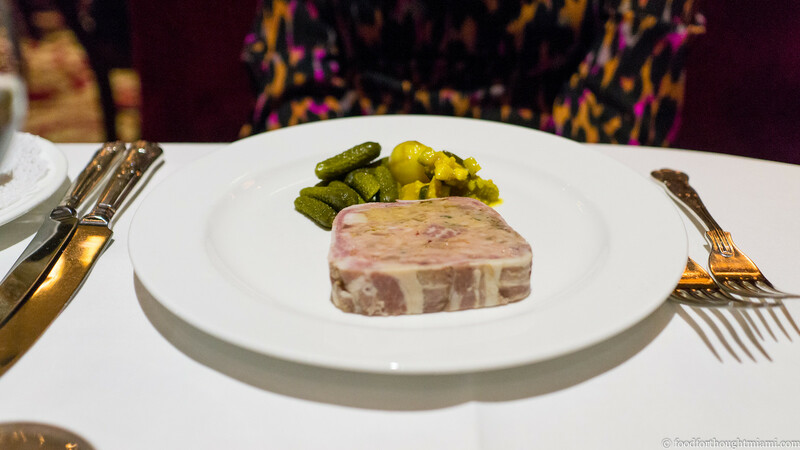 There's Middlewhite pork terrine, which makes use of a rare heritage breed of pig that originated in Yorkshire, served simply with picallili and cornichons. The shrimp taste of shrimp, the pork tastes of pork, and I couldn't possibly be happier. For her main, Mrs. F chooses the Uig Lodge smoked salmon, sourced from a smokery on the far northern reaches of the Outer Hebrides. 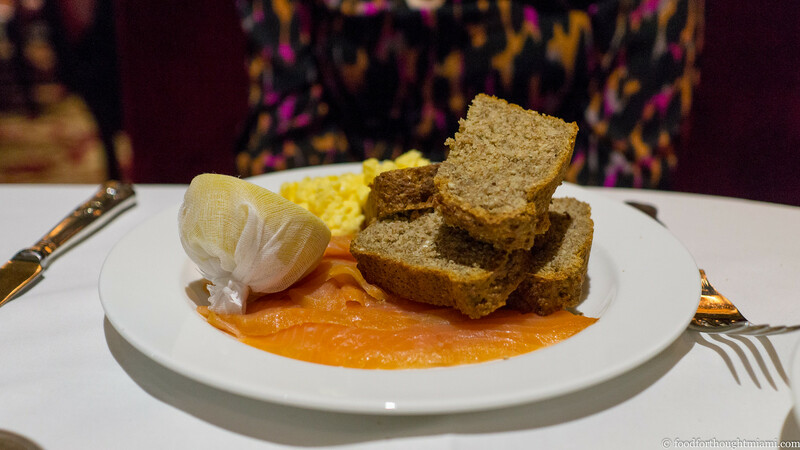 The salmon is served with fat slabs of brown bread and offered either with or without scrambled eggs, but surely this is a rhetorical question? The salt and smoke on the fish whisper rather than shout, and its texture is all silk, matched by the soft, creamy eggs. 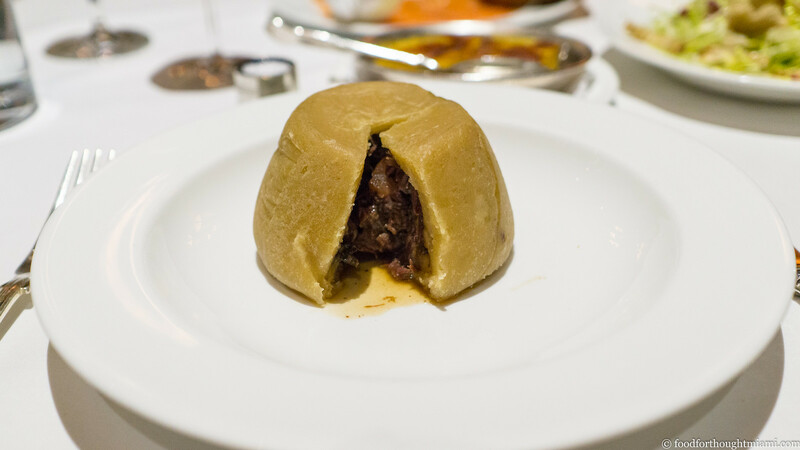 For me, a real taste of tradition: a steamed suet pudding. It arrives at the table completely unadorned, looking like a doorstop from a giant's castle. Cut it open, and beneath a layer of dense, chewy suet pastry, a stew of venison, red wine and chestnut mushrooms issues forth. There's nothing light or delicate here, but it has a brawny beauty all its own; it's rich, and hearty, and sticky, and satisfying, and I love that such things still exist in this world. Along with our mains, we have some bronze-crested, buttery-interiored potatoes Anna, as well as a perky salad with sprightly pale sprigs of frisée, crispy bacon lardons, toasty croutons and a bracing shallot vinaigrette. 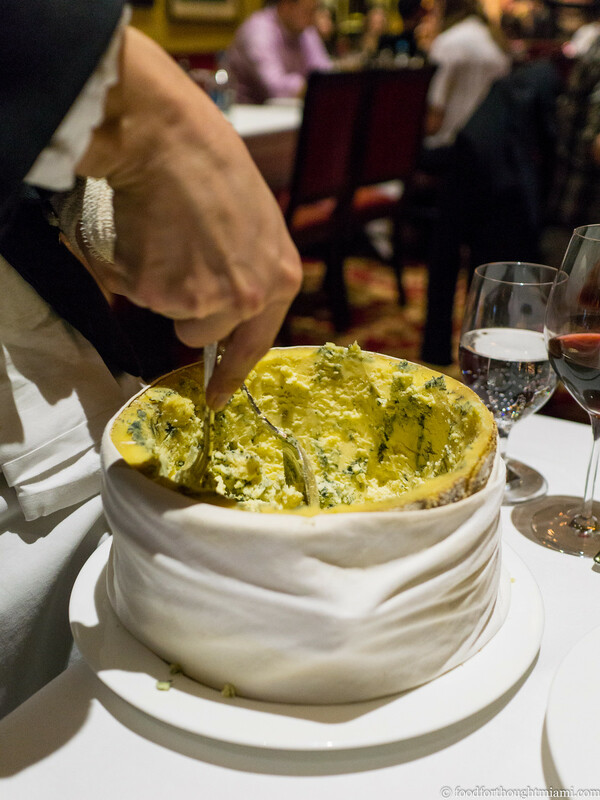 We always enjoy ending a meal with some good cheeses, but Mrs. F is not so much a fan of the blue-veined varieties. So I'm pleased to hear that the cheese plate, which features a few English cheeses served with biscuits and a sweet shallot jam, can be supplemented with a portion of the Cropwell Bishop Stilton. The entire wheel is brought to the table, from which they will scoop the paste onto your plate until you say "enough!" Made by a third-generation creamery in Nottingham, it's more creamy than crumbly, tangy enough to balance the fat but not so much to blow out your sinuses, and just lovely stuff. There's a certain danger in a place like this getting weighed down by its historical baggage, but Rules manages to avoid that. It doesn't feel, or taste, like a museum piece, but rather like a living, breathing restaurant that just happens to be from another century. But good food is timeless; I hope Rules remains so as well. There's also a massive mural on one wall of a stern-faced Margaret Thatcher looking as if she belongs on the prow of a ship. She didn't actively misbehave. She just sort of ran out of steam, started to fade and get a little teary-eyed, and quietly mewled "I'm broken." We still say this when it gets a little too late in the evening for any of us. We also drink a really nice wine, the 2010 Rossignol-Fevrier "Robardelle," a premier cru vineyard in Volnay from a producer which I don't think gets distributed in the U.S. Happily, the wine list at Rules mostly shares my predilections for Burgundies, Rhones, and sub-$100 wines.